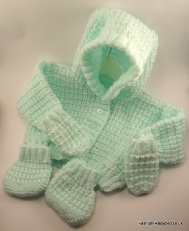 This is a lovely set, complete with hooded jacket, mittens & bootees. 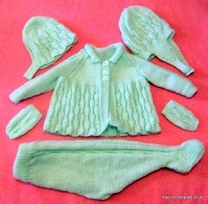 It is knitted in Baby double knit wool, with 5 buttons on the jacket and elastic around the cuffs of the mittens and bootees. Jacket - Chest : 10in / 25cm, Full Length: 8½ in / 21cm to neck, 15 in / 38 cm to top of hood. Sleeve length : 6 in / 15 cm. Bootees - 2 ½ in / 7cm width at top. 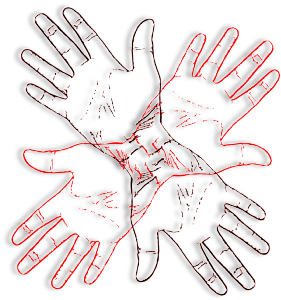 Risk of Choking (Buttons), Keep away from fire and flames. You can purchase each individual item or for a discount the complete set. I can have these made and with you in 7 days per item from my start date or 2 - 3 weeks for the set, once your order is placed I will e-mail you my start date. This is a great set for going outdoors. It has a matinee jacket which is lose at the bottom to allow for nappies. The leggings have feet which means your child can’t kick their bootees off. The mittens don’t have any ties or elastic but do stretch, so will grow with your child. The bonnet is on the left hand side of the photo, it has a chin strap which is fastened with a button. The helmet (shown on the right) has ear protectors and is fastened with a button. This is a beautiful dress set. It is knitted in 4 ply wool which is available at the moment in white only. The dress has a lovely lacy skirt which can be topped with a ribbon as shown in the photo. The dress has a back opening with 4 / 5 buttons and the cardigan has 5 buttons. This dress could also be made with a longer skirt and be used has a christening / naming ceremony gown. Matinee Coat - Chest: - 9 in / 23cm, length :- 10 in / 26cm, Sleeve :- 5½ in / 14 cm. Bonnet & Helmet:- Height, 5½ in / 14cm, Width 5½ in / 14 cm. Leggings :- Waist, 6½ in / 17 cm, Waist to foot, 17 in /44 cm. You can purchase each individual item or for a discount the complete set. If the set is ordered please state which hat is required, either the Bonnet or Helmet. I can have these made and with you in 7 days per item from my start date or 3 - 4 weeks for the set, once your order is placed I will e-mail you my start date. I can have these made and with you in 7 days per item from my start date or 3 weeks for the set, once your order is placed I will e-mail you my start date. These are great slippers, I made the pair in the photo for my son and lined them with a fake fur material. 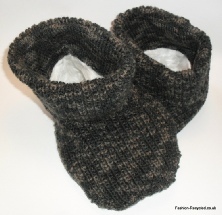 These were knitted using King Cole Moods Duet (Ashes) double knit wool, but can be knitted in any double knit wool. The ones shown are the Short Fisherman Ribbed Slippers. The other variations are Long Fisherman Ribbed Slippers (longer leg part) and Buttoned Slippers, which are plain stocking stitch, with a longer leg part and 2 buttons. Please note that these are the measurements from the pattern and could vary slightly. I recommend that you go by the foot length and not the age of the child, I made the adult size which fits my son’s size 4 feet. . The foot part is single thickness knitting, with the leg part double thickness. When lined I copy the sole and upper in fake fur and join it to the double thickness leg part. Please fill in the requirement box with as much detail as possible, if you have a yarn you would like me to use, would like lining or a certain colour, please add it in this box. I reserve the right to amend my price depending on yarn requested, but I will send you an invoice with the option of cancelling the order. This is a lovely crocheted dress in 4 ply wool. 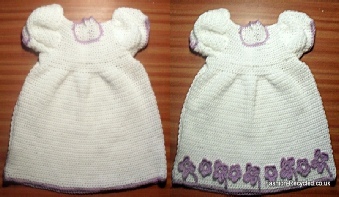 It can be made for babies between 0 - 2 years. It can be made to your colours, with or without flowers. This dress has a 3 button opening at the back of the dress, with flat white buttons. 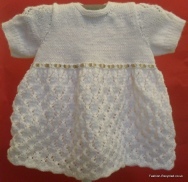 In the 1 - 2 yrs size dress the flat buttons are replaced with round pearl style buttons. There is a matching hat and jacket to go with this dress, please e-mail me for more info. At this moment this dress is only available in white, please contact me for other colours and I will try and source the yarn. 0 -3 mths : Chest, 25cm / 10in; Under arm -sleeve, 4cm / 1 1/2; under arm to bottom of skirt, 29cm / 10in. This dress is machine washable, the instructions are included on the swing tag. I can have these made and with you in 10 days from my start date, once your order is placed I will e-mail you my start date. This beautiful dress, is knitted with 4 ply wool. It is a stocking stitch body with patterned sleeves. 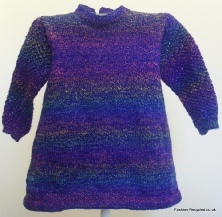 This one has been knitted using multi- coloured yarn. It is fastened using 2 buttons along the centre back opening. It has a double thickness hem around the bottom of the dress to add weight. Please note that these are the measurements from the pattern and could vary slightly, because this is an old pattern please notice the different sizes, these are the actual size.